The ‘Little X’ girdle design was a particularly remarkable design for the fact that it was fully elasticated; previously girdles would only stretch horizontally and had a tendency to move around the body during wear. The Little X used the new ‘Lycra’ fibre technology, offering more stretch and recovery than previous elastic fibres. As part of efforts to attract the youth market, the Little X was released in a host of bright colours. 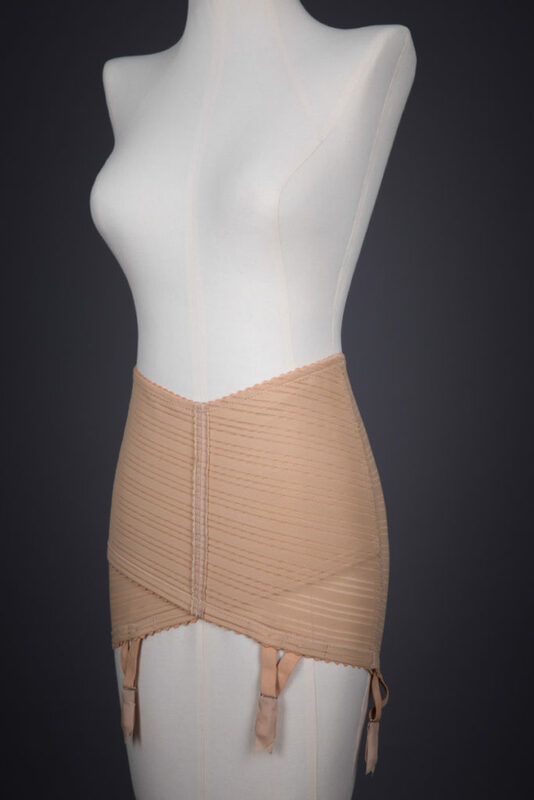 The girdle is constructed with a crossover layer of striped nylon-lycra, with the double layer of mesh at the front of the garment smoothing the abdomen. The stretch that the lycra offered meant this garment had no need for additional fastenings, and could be rolled on and off the garment. The nylon-lycra fabric also meant there was no need for spiral steel bones or other forms of structure, as the fabric offered sufficient tensile strength to shape the body and stay in place during wear. 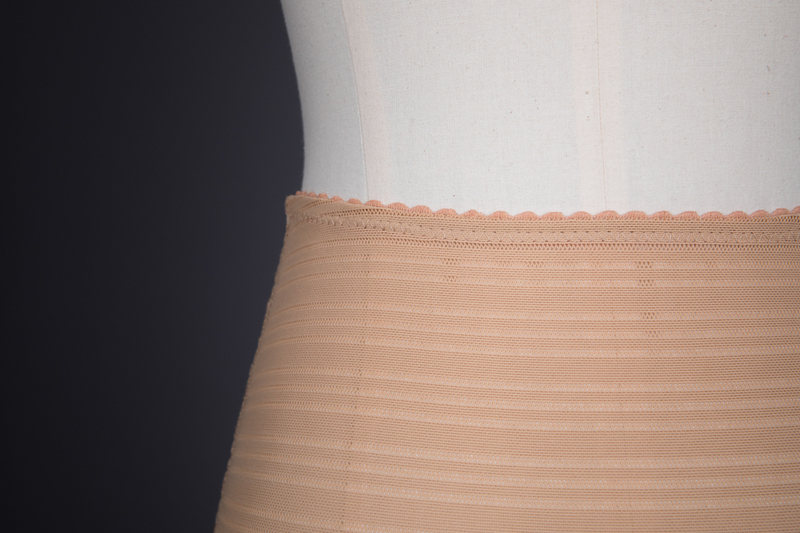 The girdle has 4 suspender straps with metal and rubber clips. 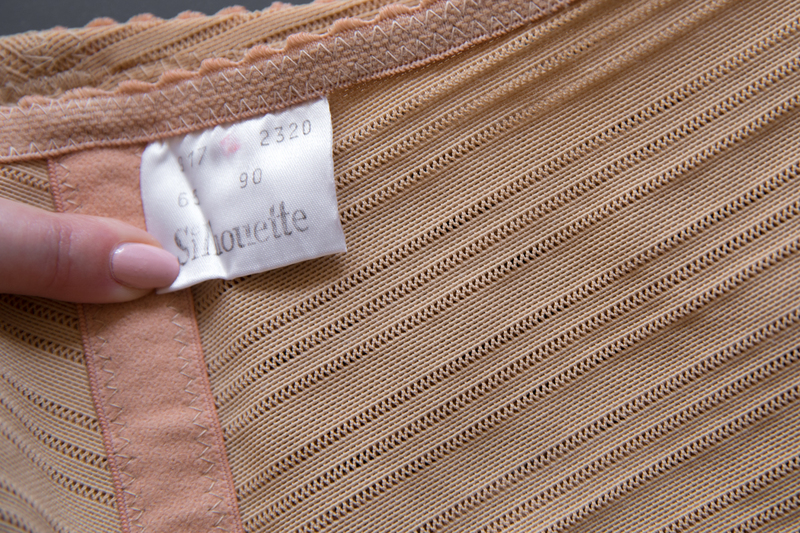 The centre line of the garment is trimmed with a scalloped ribbon trim and a ribbon bow at the waistline. 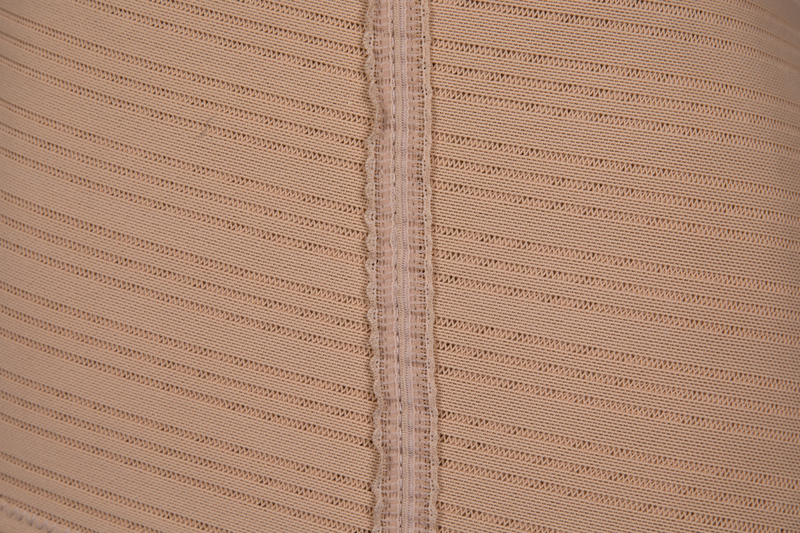 Hems are finished with a crown edged elastic trim. 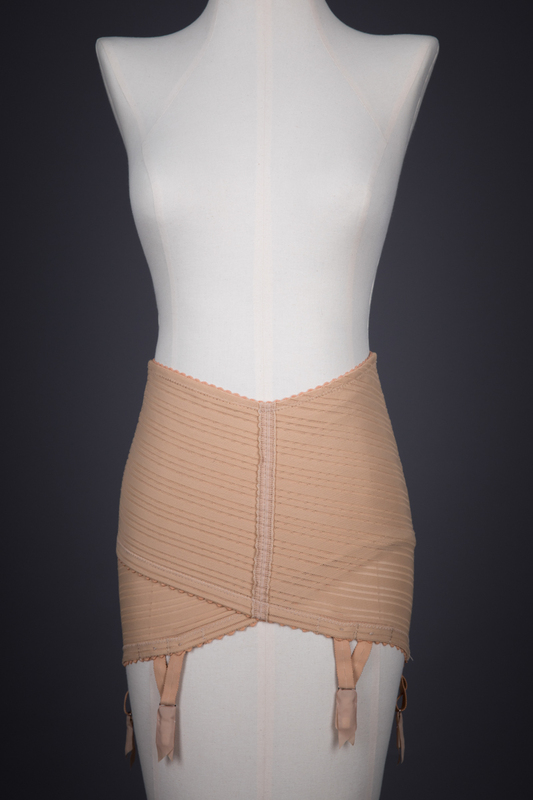 The ‘Little X’ girdle was arguably one of the most successful British foundation garments of the late 1950s. It was launched in 1955 with an unusually large advertising budget for the period (funded with loans at a great risk for the brand), who hoped to capture an emerging market of young people with an American inspired advertising campaign. The advertisements focused on images of young women dressed in all-in-one black garments, overlaid with detailed illustrations of the girdle. Drawing attention to the garment rather than the body wearing it is definitely of benefit when selling underwear, but this approach also serves to de-sexualise the young women in the images. This is a concept that historian Jill Fields refers to in her book An Intimate Affair: Women, Lingerie and Sexuality as ‘the invisible woman’ of intimate apparel advertising. Nevertheless, the campaign was immensely successful, running in cinemas and magazines. Licenses for the Little X girdle were granted to over 32 countries as turnover increased exponentially. 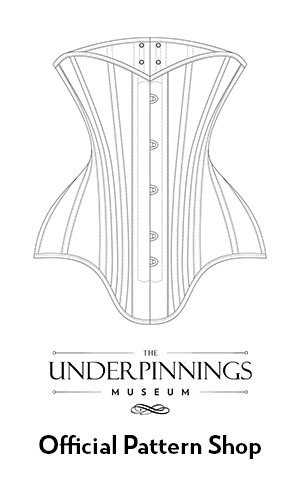 From the Underpinnings Museum collection.